Conflicting reports in Arab media pin blame on Israel, US, and UK after dozens killed at Iranian facilities in Syria. At least 18 Iranian servicemen were killed in a series of explosions at military sites across Syria Sunday night, a state-run Iranian media outlet reported Monday. Arab media outlets have issued conflicting reports Monday morning, blaming either Israel, or the US and UK for a series of explosions at military facilities in Syria believed to have been used by Iran’s Revolutionary Guard Corps. On Sunday night just after 10:30 p.m. local time, explosions were heard at military bases in Hama and Aleppo in the war-torn country. Initial reports suggest nine missiles were struck the facilities, including a base known as “Brigade 47”, outside of Hama, used by Iranian-backed militias in the region. Syrian army sources confirmed the attacks, but offered few details. “Syria is being exposed to a new aggression with some military bases being hit with missiles in rural [areas near] Hama and Aleppo,” one source said, according to a report by Reuters. According to a report by Sky News, more than 40 people were killed in the missile strikes, with dozens more injured. The UK-based Syrian Observatory for Human Rights put the death toll at 26, most of whom it claimed were “foreign fighters”, a reference to Iranians stationed in Syria. 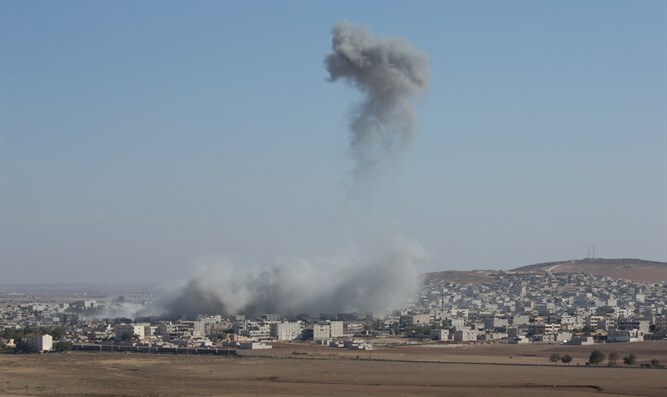 "At least 26 fighters were killed, including four Syrians," said SOHR chief Rami Abdel Rahman, AFP reported. The SOHR chief said he believed that Israel was probably behind the missile attack. "Given the nature of the target, it is likely to have been an Israeli strike." On Monday, Iran's ISNA state-run news outlet confirmed that Iranian soldiers had been killed in the explosions Sunday night. A total of 18 Iranian servicemen were killed, ISNA reported. The strikes came just hours after Israeli Prime Minister Binyamin Netanyahu spoke over the phone with President Donald Trump to discuss “threats and challenges” in the Middle East “posed by the Iranian regime”, the White House said in a statement. Earlier on Sunday, Netanyahu met with Secretary of State Mike Pompeo at IDF headquarters in Tel Aviv. On Monday, Arab media outlets accused Israel, as well as the US and Britain, of responsibility for the missile strikes. According to the Hezbollah mouthpiece Al-Akhbar in Lebanon, the Israeli Air Force carried out the attacks. But Tishreen, the pro-Assad state-run Syrian media outlet, accused the US and UK of launching land-based missiles at the facilities in Syria. Other Arab outlets, including the government-backed Syrian Arab News Agency (SANA) declined to specify the source of the missiles. In early April, seven Iranian personnel were killed in an early morning strike on the T-4 airbase in Homs. Iran accused Israel of being behind the air strike, as did the Syrian regime and Russia.